A major ceremony is under way in the Polish capital Warsaw to honour Jews who fought overwhelming Nazi German forces 70 years ago in the Warsaw Ghetto uprising. Sirens wailed and church bells tolled in the city, where several hundred Jews battled the Nazis in World War II. About 13,000 Jews died in the ghetto when the Nazis reduced it to rubble. Survivors were sent to death camps. 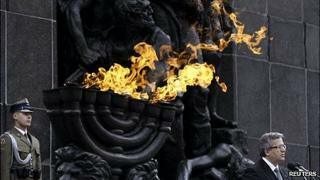 Poland's president praised the Jews' "last stand" in a speech on Friday. President Bronislaw Komorowski and Israel's Education Minister Shai Piron spoke at the Monument to the Ghetto Heroes, on the site of the former ghetto. "This was the last stand of people deprived of dignity and hope," Mr Komorowski said. "Hundreds of insurgents stood to defend the last remnants of human freedom." In 1942, before the uprising, the Nazi SS deported about 300,000 Jews from the ghetto to the Treblinka camp, where they were murdered in gas chambers. To coincide with the uprising anniversary Warsaw is opening a new Museum of the History of the Polish Jews. The museum - not yet completed - will chronicle the 1,000-year presence of Jews in Poland, a once large and thriving community mostly wiped out by the Holocaust.